Low croak and various grunts. Description: Black. White patches on forehead and nape. White eye. 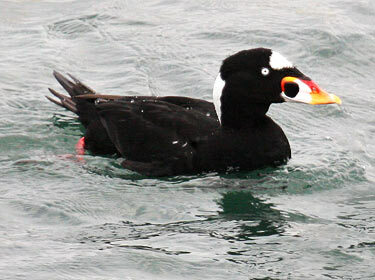 Large bill has white-black and orange-red pattern. 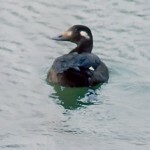 Female dark brown with two white patches on face, and no white wing patch. 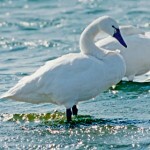 Habitat: Migrants are found on lakes, reservoirs, and larger rivers. 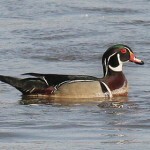 Where in Nebraska: Rare casual spring migrant across the state. Rare regular fall migrant statewide. Field Notes: The most abundant and most widely distributed of the 3 scoters breeding in North America. Well known in winter along the Atlantic and Pacific coasts. Fun Facts: Also called a “skunk-headed coot”.